It seems of vital importance to the understanding of the ideas I have, for some time, been putting forward, that the inner, qualitative side of the picture (which was always present and to which I have drawn attention from time to time) should be more explicitly developed, lest the real nature and purpose of the work be lost sight of or misconstrued. It will be appreciated that my criticism of present-day astrology is that it is fragmented, partitive and lacking those principles which will give the subject a real unity, that is a unity which provides for all the potentialities of the subject and offers a truly comprehensive basis for every aspect of interpretative symbolism. We may call the astrology which does provide such a basis, integral astrology, that is an astrology which is whole and complete, possessing all necessary and appropriate parts. It is towards such an astrology (far-distant as we are from it) that we should be trying to move. The picture which is now emerging from the reduction of astrological symbolism to its simplest elements is of a remarkable `code' based upon the rhythms of cosmic cycles (that is upon the harmonics of cosmic periods), wonderfully simple in its essence, exceedingly complex in its manifestation, capable of infinite adaptation and flexibility in its application. It appears to be the source of all the traditional doctrines which have come down to us from the past and of all new concepts which emerge from time to time in the present. The decipherment of this code depends upon an understanding of the symbolism of cosmic existences, upon a mastery of the symbolism of ideal numbers and of the right relation of both to the life of man and nature. It is a formidable task but in attempting its solution we have at our disposal three types of tool, each of immense scope and power. The first is inductive scientific method and reasoning by which conclusions are drawn and hypotheses built up and tested from a study of the world about us. One example of such a tentative conclusion is given later. The second avenue of approach is via the study of tradition, for it is clear that the ancient traditions of astrology (now largely lost or stripped down to a handful of simple rules) contained, in their purity, a most profound and comprehensive system of symbolism. An example of the scrutiny of tradition to see what it has to tell us about our present problems, is afforded by Charles Harvey's study (Astrological Journal, XII, 2, p. 21) of Hindu astrology (which has preserved a far more diverse tradition than current western astrology). The third tool at our disposal is that of deductive philosophic reasoning from first principles. It is easy to see how each of these three modes of approach steadies, supplements and fortifies the other two. This article is intended to exemplify the third type of approach. Those who have read Mr Harvey's article will probably have grasped the concept of the division of the complete circle of the horoscope into subordinate circles or cycles -- in the case of the navamsa chart, into nine subordinate cycles. Now the nine waves of the ninth harmonic are simply nine cycles or circles within the full circle; a wave is only a circle somewhat straightened out and in fixing the positions of planets in the navamsa chart we are simply fixing their position in the ninth harmonic. All this is explained in Mr Harvey's article. The horoscope, it transpires (and this lies behind all the subdivisions of Hindu astrology) is constructed along the same lines as that little gas or electric meter which we all have at home in the cellar or under the stairs. There is one dial for units, one for tens, one for hundreds, one for thousands and so on. And each dial deals with the measurements which are appropriate to it, and with those only. Now in recent years a good deal has been heard of the `90° dial' introduced by the Ebertin School. In using this instrument the planetary positions of the horoscope are transposed from the full circle of 360° and given new positions showing their relationship to the 90° sector in which they are situated, each 90° sector being re-expressed as a full cycle or circle in its own right. The effect of this is to highlight the relationship of planets to each other in the fourth harmonic, and since the number four is so important in relation to the idea of manifestation, the relationships revealed by the 90° dial are found, by those who use them, to be very significant. The criticism might be made however, that the twelvefold structure of the zodiac is already adapted to reveal, to the eye of the experienced astrologer, relationships within the 90° sector. A thorough grasp of the triplicities enables him to spot most of these without the help of a dial. 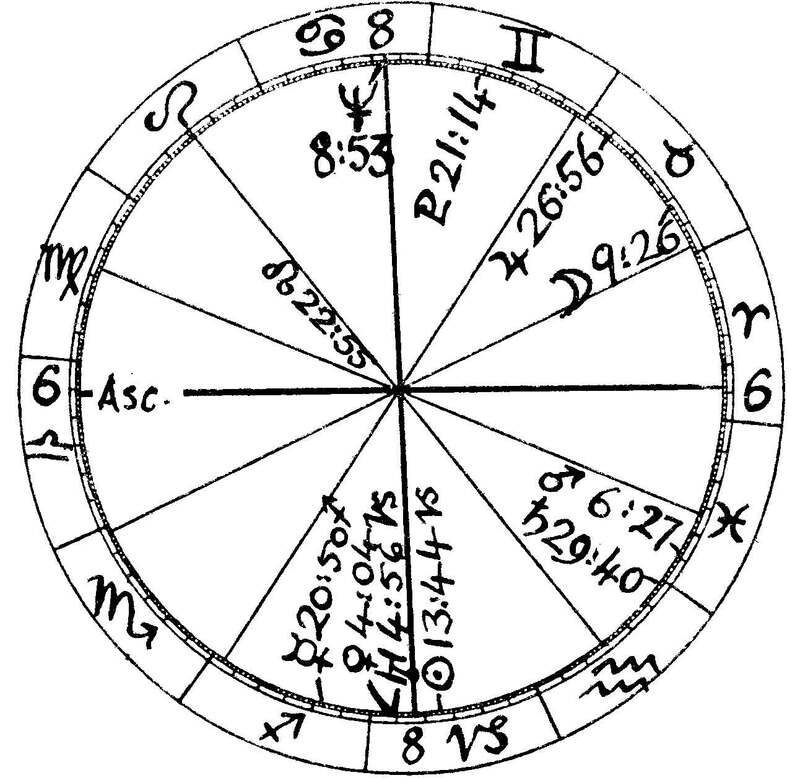 But it is now clear from the harmonic analyses of horoscopic factors which have been done that, if we are to restore to astrology its integral character, we must learn to understand clearly the symbolism of all numbers and to read aright the measurements shown on many other dials besides the 90° dial. The great importance of the twelvefold division of the zodiac arises simply because it can be divided by one, two, three, four and six, and thus is adapted to incorporate the symbolism of all these numbers. But what of the division by five, seven, eight and nine? The symbolism of the twelve signs has been explored and written about again and again until it has soaked into us and become part of our very thinking. We must now set ourselves to explore and to become just as thoroughly familiar with the symbolism of other numbers so that we know exactly what order of classification they deal with. What then is this `system' which unites the duad and the triad? There are a number of ways in which we can consider it, but since we are especially interested in the application of five to the human nativity it will be best to find out how this system applies to man's life in the realms of manifestation. Now although man is spirit, soul and body, yet the incarnating unity of his manifested life is the soul and when we view man from `below we see soul as the primal unity (subject) with body as its outward vehicle and expression (object). This constitutes our basic duad: soul above and body below. The triad is formed by the three classes of soul faculty: mind, will and heart (which address themselves to the true, the good and the beautiful respectively). Thus we have a trinity of faculties united `above' in soul and `below' in body. This is, so to speak, the human pentad in the manifested order which we shall see clearly expressed over and over again in man's outward life and institutions and, indeed, in his very body. We shall always find them arranged in the same descending order: soul - mind - will - heart - body. First, in order to be clear about the basic character of each of these principles, let us outline the function of each in human life. Under the heading of `mind' are included all man's gnostic powers, from the highest to the lowest; all the means by which he achieves knowledge and understanding. These, we shall see, are capable of a fivefold classification. In the larger sphere of man's terrestrial life they express themselves in human PHILOSOPHY and SCIENCE; in fact in man's search for truth. Under `will' are included all man's elective and purposive faculties, all the graduations of that general faculty by which he makes and adheres to a choice between good and evil, or more properly, between a greater and a less good. These also are capable of a fivefold division and find their larger expression in man's RELIGION, that is, in his active life in conformity with ideals and principles. Under `heart' are included every aspect of man's affectional and aspirational nature, that is every faculty through which he admires the beautiful or delightful, gives his allegiance to it and seeks to enjoy and express it. These also are capable of a fivefold division and express themselves, in the larger sense, in man's ART. Under body is included not only man's physical and other bodies but also, in a sense, all man's contact with the mundane order and his work, turning downwards and outwards, in building the City of God on earth. Soul represents the unification of man's faculties as they turn upwards and inwards in the quest to know, love and unite with God. Among human activities it correlates with MYSTICISM. There are five branches of these corresponding to the fivefold order already described. They are: intuition, reason, opinion, instinct and sense. Intuition, like soul, is unitive in relation to the other four; reason is the most characteristically human mental faculty corresponding in our original pentad to mind; the third faculty, which I have called opinion, might equally well be called judgment or estimation. (This faculty is above instinct but below reason; if we are asked how far it is to the post office we do not refer the problem to the instincts, yet, although we deliberate briefly, we do not refer it to the reason proper). This gnostic faculty correlates with will because it is the one which most characteristically precedes action in our everyday lives. The two lower gnostic faculties, instinct and sense, are self-evident. The former corresponds to heart because it informs us of those things in which the natural desires and appetencies are the governing factors. Each of these five branches of the gnostic powers divide again naturally into five sub-branches. The five senses (body) are the most obvious and are dealt with below. To enumerate all the sub branches of the others might seem pedantic but each subdivision of the gnostic faculties has its characteristic objects of knowledge. The function of the will is to control. It is galvanised by the `heart' and guided by the `head' but it has the special quality of fixity so that it can hold to a certain course when the impulse from the heart which originally moved it and the illumination from the mind which originally directed it, are no longer present. Ideally the will puts and holds all things in their proper places and relationships. That is to say it ordinates and co-ordinates. Closely associated with will is the concept of conscience. It is sometimes assumed that the conscience is simple and of one nature but in fact we can see, on closer inspection, that it has a five-fold composition in conformity to the principles already laid down. Crudely put, conscience chooses between good and bad. We can then see that at the level of what is good or bad for the body there is a moral instinct; at the level of heart a moral sentiment, at the level of will a moral habit and above that a moral reason and a moral intuition. A man may, for example, have a conscientious objection to military service. But what lies behind this objection may vary qualitatively. At the lowest level his instincts may have told him that a soldier's life will involve him in dangers which he does not care for; or he may be guided by sentiment (like Arjuna, in his famous dialogue with Krishna in the Bhagavadgita, when he pleaded that many of those arrayed against him were his own kindred and friends). Or he may have been brought up as a Quaker or in some other sect with strong teachings against military service ,and if he is to stand by the religious principles of his upbringing he will refuse to enlist. So far (and without anticipating his ultimate decision) we can see that he has not used the right faculty for the job; only the moral reason or moral intuition (which will never conflict with the reason, even though it reach its conclusion by a shorter route) can decide the right or wrong of such a matter. But that is not to say that there are not certain matters where the moral instinct, say, is not the most appropriate faculty for the job. Just in the same way that we have found five branches of the gnostic and volitional powers, so we can make the same distinction in relation to the affectional and aesthetic faculties. This is not difficult and the reader may try it for himself. We have suggested that in terms of the broad picture of human activity, the will corresponds to religion. Again we can see that the religions of mankind could be grouped via our classification according to whether they were essentially mystical (soul) or cultivated primarily the ideals of truth and understanding (mind) or morality (will) or devotion (heart) or various kinds of phenomenalism, such as `spiritism' (body). Similarly the arts of mankind have been correlated with `heart'. Now although we usually associate art with what are called the `fine arts' because they are especially concerned with the realisation and expression of beauty, yet, in the wider sense, all human activities may be regarded as arts. Thus we have the art of the physician, the teacher or the welder. In this way all human activities can be classified according to our fivefold order. Highest are those activities which subserve the art of the perfect life; these correspond to soul and represent the unification and blending of all subordinate powers in the realisation and service of the ideal. Then come those arts - they are primarily of a `teaching' character in the widest sense - which have as their object the unfoldment of Truth in the mind. Next come those arts which play an ordinative role in society, just as the will does in the life of the individual. Medicine, politics, the services, law, the church (what we usually call the `professions') are, for example, of this nature. Below this are those arts which are connected with the realisation of the beautiful and enjoyable in life. These correlate with heart and include all the so-called fine arts, the arts of the entertainer and so on. At the bottom of the scale, corresponding to body, are those arts which are of a purely pragmatic nature, usefully meeting all the thousand and one practical needs in man's life. It is easy to see that each of these divisions will divide and subdivide again and again by five. Thus in my article on the Sun positions of physicians (one of the five branches of the ordinative arts) in last autumn's Journal, I mentioned that Paracelsus speaks of the `five sects of physicians' who specialise in the five types of bodily disorder. Now it is obvious that although it is possible to make a theoretical fivefold division of human activities along these lines, according to their dominant purpose and intention, yet in practice it is of course very difficult and this is confirmed by the somewhat tangled multiplicity of orders into which the Indian caste system (which was and is clearly based on our classification in its purity) has split up in practice. However, we can still see the framework quite clearly: four traditional castes carrying on the activities listed in the previous section and united by a fifth group which is above them all. The highest caste is that of the Brahmans (mind), then the Kshatriyas (military and governing, corresponding to will), the Vaishyas (trading and agricultural which correspond to `heart' in this system because they directly minister to man's needs as a living being) and the Sudras (menial and artisan). But over and above these four groups there is, in effect a fifth group of those who have turned away from the world and all that these four castes stand for in the way of separate interests. These are of course the `holy men' who have chosen to devote themselves to God, and into this group men from any other caste-group may pass; thus it unites the other four. In the Republic of Plato a picture is drawn of an ideal state and its government. It is essentially a state in which all factors and forces have been co-ordinated so that a condition of unity and harmony prevails. Thus, in terms of a political ideal it represents the first and highest of our five categories. By the time the eighth book is reached the character of this republic has been fully described but Socrates agrees that in the realms of change such a state cannot survive and then he goes on to describe, in response to questions, the four successive stages of government down the scale of which events are likely to slide when the ideal republic ceases to prevail. He says that such different types of states do not grow on trees (`are not gathered from the rocks' is his phrase, I think) but arise because they correspond to the type of men who live in them. I will not spoil the fun for those who have not read this chapter but will only say that the next-to-last type of government is a democracy and it corresponds to `heart' in our classification. Those who like their bed-time reading to be a bit spine-chilling could do worse than read Socrates' description of a democracy. They will have no difficulty in recognising the whole swinging scene (one in which everybody does just whatever he has a fancy to do). Socrates shows that each type of government is overthrown by the thing it prizes most - in the case of a democracy, freedom. So the people choose for themselves a champion who will free them from some supposed oppression - only to find themselves landed with the lowest class of government, a tyranny. In our last two examples the emphasis in our `five' has been upon four subordinated to one superior and unifying principle. If we wish to see a living embodiment of this aspect of the pentad, we have only to lift up our hand, juxtapose the thumb in front of the four fingers and let the tips of our fingers bend over to gather about the head of the thumb. The symbolism of the thumb as representing man's status as a self-conscious rational being (which necessarily implies an individual soul) is well known, and the other fingers are arranged in the now-familiar order: the index or teaching finger (mind), the middle or Saturn finger (will), the Sun or Apollo finger (heart) and the little finger, Mercury in its Virgo aspect, (body). An appreciation and recollection of this arrangement enables one to understand much about the symbolism of the hand and its movements. I believe the principal (or at least one important) manifestation of the fivefold classification in Indian astrology are the nadiamsas. The nadis are one-fifth part of a degree (12') - one hundred and fifty to a sign - divided into a positive and negative half (one is really dealing with the 1,800th harmonic) and the literature of Indian astrology contains descriptions, for each nadi, of the native's life (based, I think, on the Moon's position), giving the place and conditions of birth and parentage, caste, vocation, marriage, children, length of life and so on. It will be appreciated that the smaller the division, the more distinctions it incorporates. Thus, if we divide the horoscope in two, east and west, it will only tell us of self and not-self. If we divide it again, north and south, we shall have four quadrants each with its characteristics; if we superimpose on this the division by three we have twelve divisions each capable of telling us about a considerable variety of things (but quite useless for telling us about other things). So, as one goes on dividing and subdividing the circle, the segments come to include an ever greater range of distinctions. In considering the basic character given to our five-fold nadi division we see two things: first that it is based on precisely the same model we have been dealing with but, second, that whilst the principles dealt with are, in their purity, the same, the planetary symbols used may not at first seem apt. The five nadis of each degree are ruled successively (Mr Abayacoon tells me) by Mars-fire (will), Saturn-air (mind) Jupiter-ether (soul), Mercury-earth (body) and Venus-water (heart). When the two ends of this cycle are joined up the order is, of course, the same as in our other examples, but it will be seen that whilst Mercury still represents earth and body (as in the digits of the hand) Venus has taken the place of Sun as the symbol for heart. This is a perfectly acceptable change. Some will query Saturn for air (mind) but this, too, has perfectly respectable symbolic antecedents: Milton's poem `Il Penseroso' describes a perfect Saturn type: the sober, thoughtful, introspective philosophical man. And so on. This is an exercise in looking past the planetary symbol to see how and in what sense it is used. We saw earlier that one of the five branches of the gnostic faculties was sense - or, as we usually say, the senses. Being now experienced in the use of our fivefold classification we shall have no difficulty in allocating each of the five senses to its place in this system. Touch, being dependent upon physical contact, goes with body; taste being connected with what we enjoy (as when we say something is to our taste) and the word being, furthermore, employed as expressive of aesthetic appreciation and judgment, goes with heart; sight clearly goes with mind for we constantly use such metaphors as `I see', `to throw light on' etc. which connect vision with understanding; hearing and sound are connected with will as when we think of the word or logos as expressive of God's will - that which has been uttered or ordained. This leaves us with smell, the most elusive, unitive and evocative of the senses as correlated with soul and the mystical element in life. This allocation (like all the others, indeed) is profoundly interesting. Smell, like the intuition, gives a unitive impression as when, in certain circumstances, we may speak of the smell of evil, the odour of sanctity, the perfume of prayer or holiness, the fragrance of memory. But all these allocations are deeply informative. So far we have been gaining experience and practice in understanding and applying our fivefold classification in different fields, but we have not yet attempted to apply these distinctions to the horoscope. This, however, should be our ultimate purpose and it is obvious that the five senses provide us with a good field in which to test our knowledge. (The third house, for example, will often tell us of a defect in the senses, but this is only because it deals with our communicative appetency and our knowledge of relationships and a defect in one of the senses is an impediment in this field. But the third house does not distinguish between the senses [how could it?]). At the time when material for this article was being assembled, my wife remarked one day that the piano needed tuning and it crossed my mind that I was slightly acquainted with a blind piano-tuner who, if his time of birth were known, might provide the ideal subject for a study of the senses since, in his case, the loss of one sense had been matched by the enhancement of another. My best expectations were exceeded for, being unmarried and having lived with his mother until her death, he was able to state definitely that he was born towards midnight, that it was after 11.30 and before 11.45 p.m. and he suggested that 11.40 p.m. on 4 Jan 1906 (S. London) would almost certainly be within five minutes of the correct time. This gives us our horoscope (Fig. 1). The native states that he became blind on his tenth birthday as a result of cerebro-spinal meningitis. A most interesting person, he combines the affable and courteous demeanour of Libra rising with the resolute independence of ruler conjunction Uranus. He travels freely on his own about London on public transport and, apart from the special development of the hearing faculty needed by a piano tuner, he appears to be a most fluent and sensitive pianist. Now those readers who recall what was said at the beginning of this article about the horoscope as a system of `dials' and who have related this to the fivefold system of symbolism since described, will have realised that it is suggested that, as we divide and subdivide human nature, its qualities, faculties and attributes into successive divisions of five, we are really moving down through the successive divisions of the fifth harmonic, that is through the fifth, the twenty-fifth (5 x 5), the one hundred and twenty-fifth (5 x 5 x 5) and so on and that, if we are going to look for some abnormality in one of these fivefold divisions of man, then we shall find it in one place and one place only, namely in one of these fivefold divisions in the horoscope. 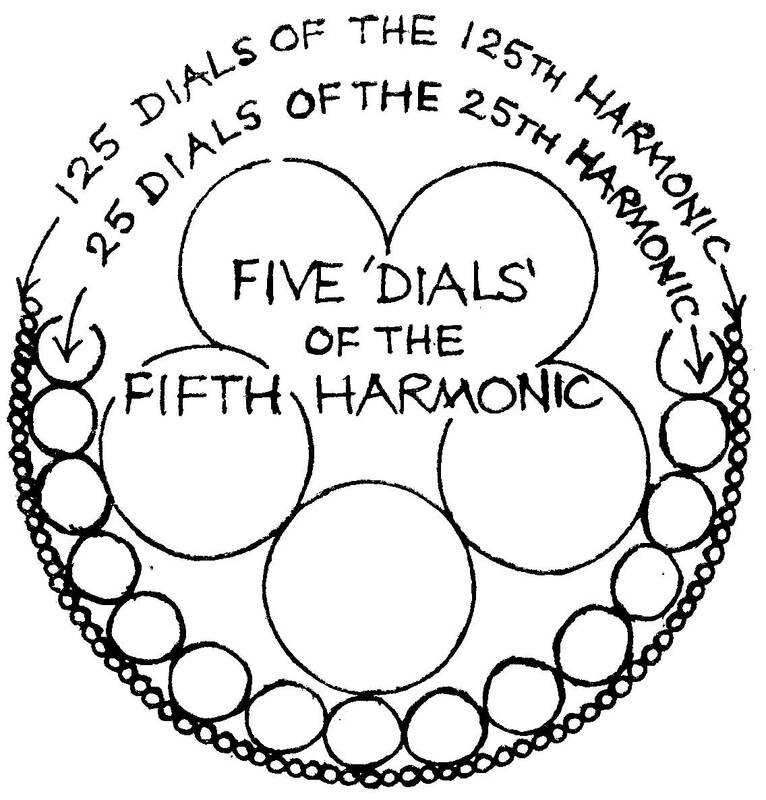 The position can be represented diagrammatically as in Figure 2: each of the five waves of the fifth harmonic is like a cycle or circle; each one a little zodiac; the same applies to the twenty-fifth and the one hundred and twenty-fifth. One has to discover the position of the planets in these minor cycles, putting all the positions in the fifth harmonic of 72° into one circle (just as all the positions in each 90° are put into one circle in the case of the 90° dial) and so on with each lesser harmonic. Now at present we are feeling our way in this field but if our theory is correct a chart such as the one given should show indications of blindness when transferred to one of these fivefold charts. Perhaps it will show in more than one; perhaps actual physical blindness does not appear unless there is something which corresponds to this at every level. Mercury 14.10 Scorpio, Neptune 14.25 Leo and Pluto 16.10 Taurus. This gives a very close and very characteristic T-cross, Mercury opposition Pluto and square Neptune. Mercury 10.50 Taurus, Neptune 11.40 Aquarius and Mars 11.15 Leo. an almost exact and very typical T-cross. Mercury 24.10 Libra, Mars 26.15 Capricorn and Neptune 0.25 Leo. another close and typical T-cross. Each of these is independent of the other. Notice that in the 25th harmonic an orb of 1' in the natal map becomes an orb of 25', and in the 125th harmonic a natal orb of 1' becomes 125' (or 2° 05'). What does this mean in terms of our T-crosses? There are six aspects involved, four squares, two oppositions. It will now be seen that, of these six, three show an orb in the natal map of 1', two show an orb of 2' and the sixth 3'. Thus the relationship of the planets in these T-crosses is fully appropriate as to meaning, almost exact in closeness and totally invisible from an ordinary examination of the natal map. The one thing which cannot yet be pinpointed, but the possibility of which seems to me to be fully implicit in the result, is exactly how to distinguish blindness from, say, deafness by the subdivisions of the ecliptic occupied by planets. I said in the introductory part of this article that I would give an example of an inductive conclusion from this field of study. The T-cross above-mentioned in the 25th harmonic is extremely apt; not only does Mercury fall in the third house of the new map (that based on the new ascendant) but its square to Mars in Leo in the sixth looks very characteristic of cerebro-spinal meningitis. Now it will be appreciated that squares in the 25th harmonic, if they are to be reduced to their simplest expression, can be regarded as conjunctions in the 100th harmonic (4 x 25). This is interesting because, thanks to the good offices of Axel Harvey, a massive programme of harmonic analysis by computer has recently been undertaken comprising over 20,000 sets of birth data and from all these data the most outstanding single result was the 100th harmonic in the Sun position of sufferers from paralytic poliomyelitis. We therefore have two outstanding results which seem to link extreme injury to the nervous system with the 100th harmonic. There are a great many other things that could be said about this example, and as to the number five, one has only scratched the surface of its symbolism. The great importance of this station of the number five, which puts it, like man himself, at the cross-roads of all forces, is fraught with great interest but we must leave that for another occasion.